If you’re a Jane Austen fan you’ll want to visit the Georgian town of Bath in England as she moved here in 1801. 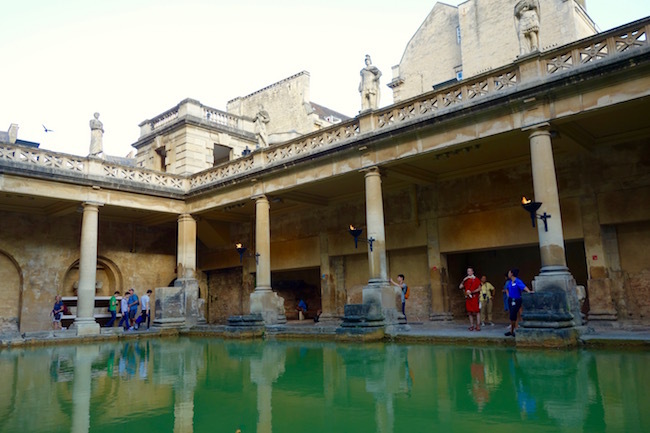 Here are the best sights to see and top attractions to visit so that you can spa like Jane Austen in Bath. 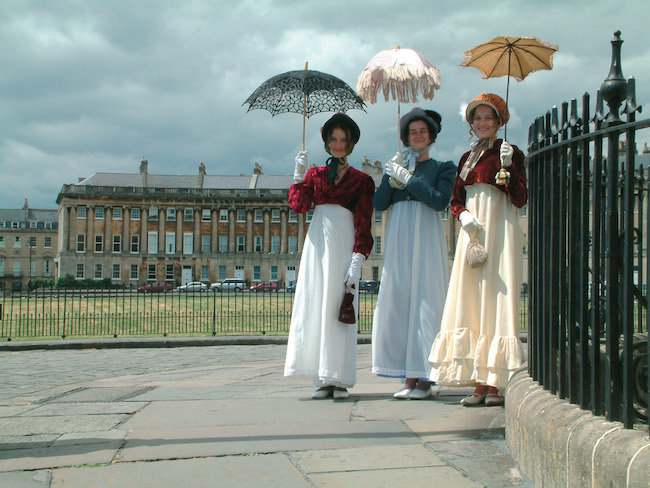 Jane Austen, the author of Pride and Prejudice, hated Bath. It’s ironic, therefore, that this golden-hued city in Somerset, 140 km west of London, has become a sort of shrine to her, with the Jane Austen Centre, Jane Austen Tours, and even the annual Jane Austen Festival. The locals I talked to find this amusing. After all, it wasn’t them she didn’t like. It was the outsiders who flocked here for the winter season, the not quite top tier “country gentry,” whose social aspirations and crafty marriage maneuvering set Austen’s teeth on edge. Bath has had many ups and downs in its history, and unfortunately Jane Austen hit it on a downslide when she moved here due to her father’s ill health in 1801. The thermal springs, containing more than 42 different minerals, were still considered healing, but by 1801 Bath’s heyday as an elite Georgian spa town was on the wane, and the aristocratic spa lovers had moved on to the sea air of Brighton. Luckily for travellers to Bath, just as the Romans left their elaborate bathing temple behind when they pulled out of Britain about 410 AD, the 18th-century Georgians left behind a limestone vision of broad avenues, terrace houses and elegant public buildings based on classical Rome, making it one of the most beautiful cities in Europe. I’m all for wallowing in some Jane-Austen-in-Bath splendour, so I followed Catherine’s footsteps to the Pump Room in the Abbey Churchyard. It’s here that Catherine would drink the requisite three glasses of curative water each day followed by turns around the room with her dearest (and most fickle) friend, Isabella. In those days a spa regime consisted of drinking the thermal water, bathing in it and taking gentle exercise every day. The spacious Pump Room, empty in Austen’s time to provide walking space, is now an airy restaurant, but the Corinthian pillars still soar, the 10,000 year-old water is still served up hot, and the atmosphere is every bit as grand as it was in Georgian times. While I sipped a glass of water from England’s only hot spring I couldn’t help thinking about the horrific lack of sanitation during Austen’s time. It seems so at odds with the exquisite architecture it was hard to believe the squalid toilet tales I’d heard about the Georgians, particularly the one (whispered to me by a local) that women, hidden behind their voluminous skirts, might even squat in the street. Ick. 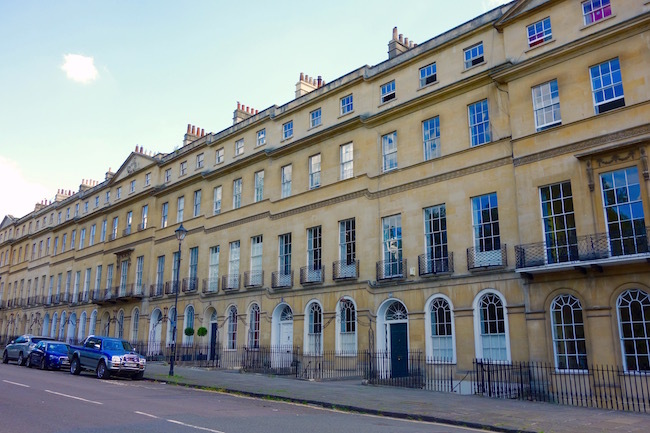 Today the Royal Crescent is still the grandest street in Bath, and the first house on the crescent (One Royal Crescent) has been restored and made into a museum. While the moss-green silk damask walls of the drawing room and Chippendale mahogany furniture conjures thoughts of genteel refinement, this image crumbled when a guide stationed in the dining room pointed out a screen where diners might have ducked to relieve themselves. 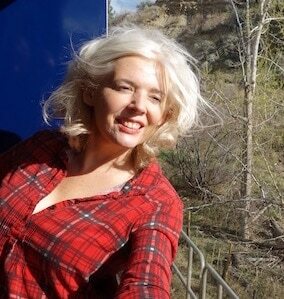 If I’d managed to get the toilet situation out of my head before, it was back in place now. I managed to wash it away by visiting the Roman Baths that evening, leaving the Georgian world behind and travelling back to the 1st century AD. The luminous jade water of the Great Bath glowed eerily in the torchlight and shadows were thrown onto the archways. Above the roofless pool stand lifelike statues of Roman emperors and governors, Victorian additions installed in 1894. Two layers of history, 18 centuries apart, but connected by a devotion to the thermal water of Bath. Over the centuries the Roman Baths fell into disrepair, roofs crumbled and the baths were silted over. By the time Jane Austen moved to Bath the ancient site had been rediscovered, but not excavated. The Great Bath – the main pool in the Roman bath site – didn’t reopen until 1896, but bathers during Austen’s time had a few different bathing options. There was the Hot Bath, now used for water-based spa therapies; the King’s Bath, which dates back to the 12th century and is built on the foundations of the Roman Baths (you can see it on your way from the Roman Baths to the Pump Room) and the Queen’s Bath, built in the 1500s and which, during Jane Austen’s era, was only open to women. FYI: Jane’s brother came to Bath to treat his gout. 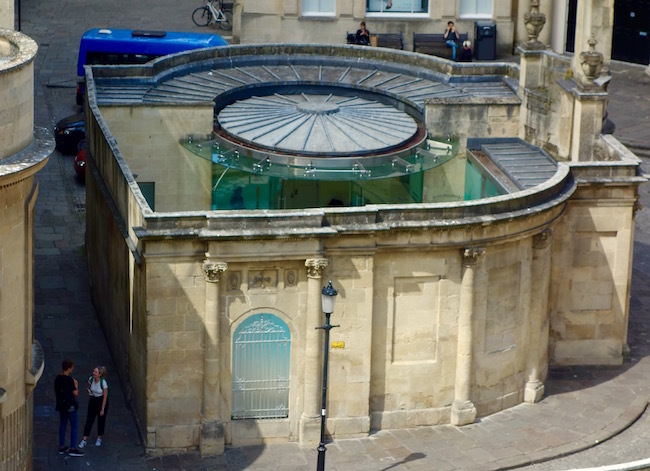 Another historic bath open during the Georgian era is the Cross Bath, a small intimate building with a softly-curved facade. 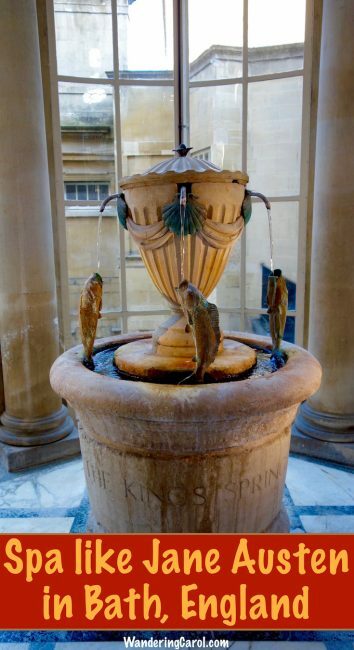 A favourite bathing spot of nobility, this small bathing spot was credited with curing Queen Mary’s infertility in 1687, a fertility miracle that helped put the curative water of Bath back on the spa-loving map. If you want to spa like Jane Austen in Bath, but in an intimate setting, booking some time in the Cross Bath is one of the best ways to soak up history. To really spa like Jane Austen in Bath, however, you would need to wear a gown of cotton, wool or linen, and perhaps a bonnet, too. Today, the main way to spa in Bath is at the Thermae Bath Spa. 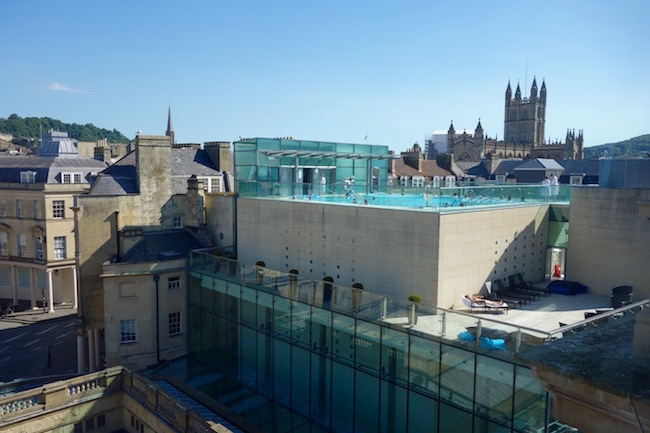 Opened in 2006, the Thermae Bath Spa towers over the original Roman Baths, a sleek construction of glass and Bath stone. With a rooftop pool, an extensive sauna world, indoor pool, sun terrace, full service spa and cafe, it’s an updated interpretation of the traditional Bath spa experience. 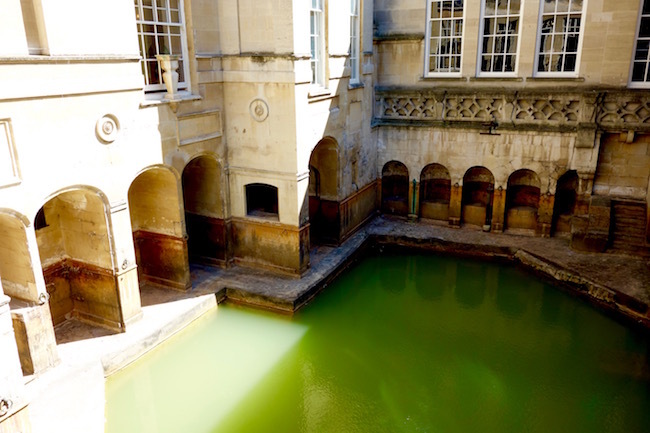 It was time to spa like Jane Austen in Bath for myself, so I headed to the Thermae Bath Spa. 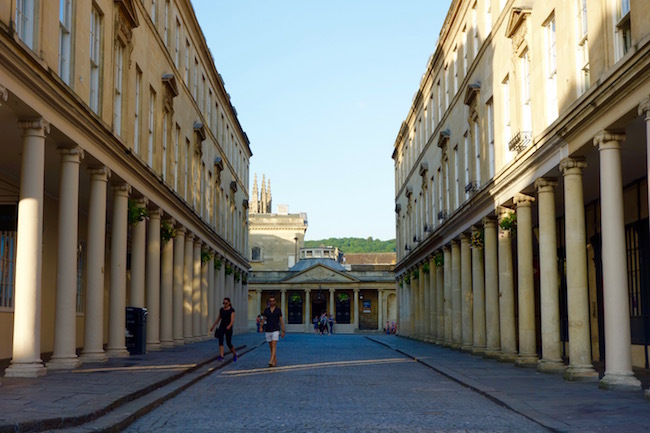 Compared to the golden richness of the older buildings, the newer quarried limestone of the spa looked as bright as newly-sheared bone, as if it had been transplanted live to become part of Bath’s living museum. Floating in the rooftop pool, soaking in the same warm spring water that the Georgians, the Elizabethans, Romans and Celts before them had revered, I couldn’t help wondering if, in centuries to come, when the Thermae Bath Spa’s stone has mellowed to the same honey-toned hue as the other heritage buildings in Bath, sightseers will marvel at its historic appeal and wonder about our ancient bathing traditions. 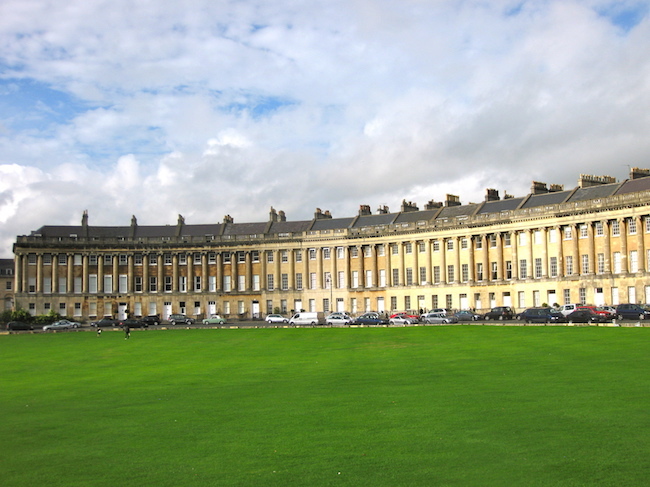 Getting to Bath, England: The nearest Airport is Bristol but it’s easy to get to Bath by train. Regular train service runs from London, Paddington Station to Bath. Travel time is about 1 hour 30 minutes. 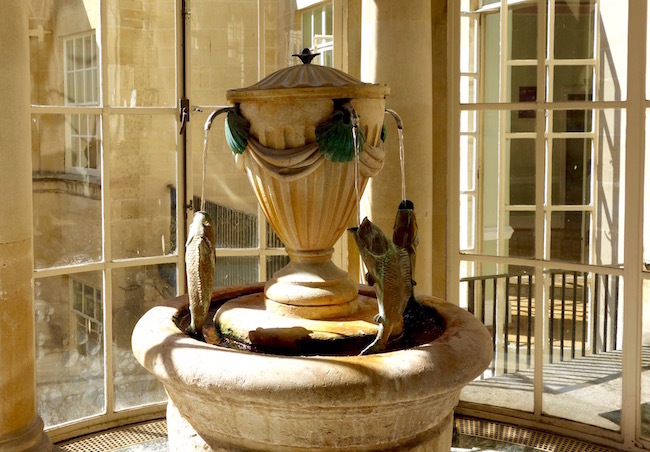 The Pump Room: Visiting the Pump Room is a highlight of Bath, and just like Jane, you can taste the water. Look for the fish fountain and wait at the counter. Eventually a waiter will come by and pour you a glass. Better yet, stay for a meal or high tea. It’s located just off the Abbey Churchyard by Stall Street. 4 Sydney Place. Now a self-catered apartment, this is where Jane Austen lived with her family for 3 years. Across the street from 4 Sydney Place is the Holburne Museum. In Jane’s time, this was the Sydney Hotel, where she was known to go for breakfast and which fronted the Sydney Gardens where she liked to walk. The park is still beautiful today and the museum well worth a visit. Jane Austen also lived at 25 Gay Street with her mother and sister after her father died and the family’s financial situation was reduced. The Jane Austen Centre: Also on Gay Street at number 40 is the Jane Austen Centre. 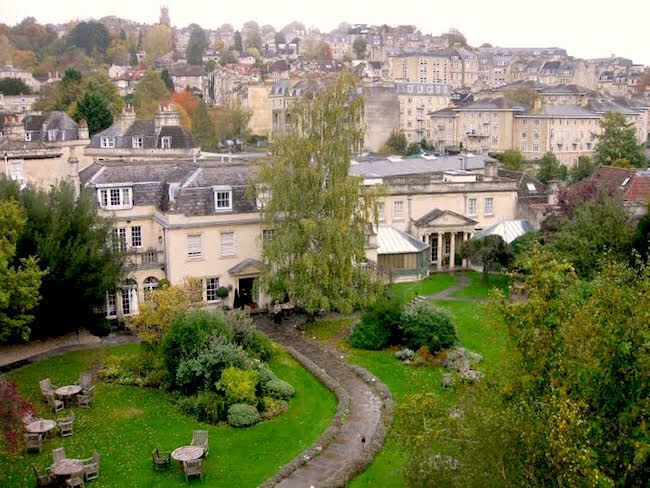 Get a peek at the writer’s life in Bath and learn how it influenced her writing in the Georgian-era townhouse. Dress up in period clothing or relax in the Regency tearoom. Devoted fans will want to visit during the Jane Austen Festival in September. 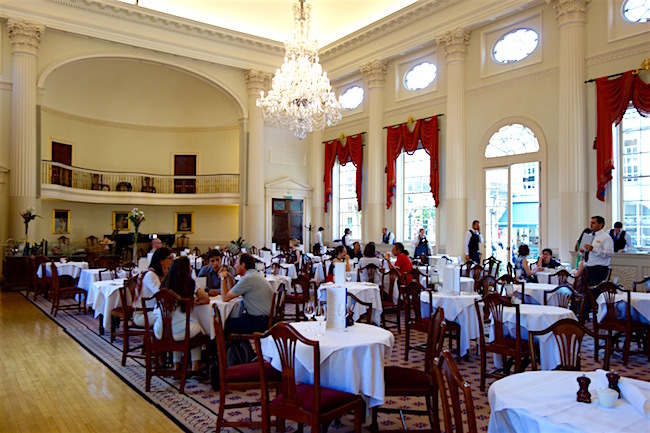 The Assembly Rooms, Built in 1771, these four rooms are where balls and other social functions were held. It was definitely the hub of the social swirl. You can visit the Assembly Rooms and the Fashion Museum on Bennett Street. The Georgian museum of No 1. Royal Crescent. Learn more about Georgian interiors and design at this elegant townhouse (and former hotel) built between1767 and 1774. Take a walk on romantic Gravel Walk, the setting for a love scene in Persuasion. Part way down, just behind 4 The Circus, is a Georgian garden. 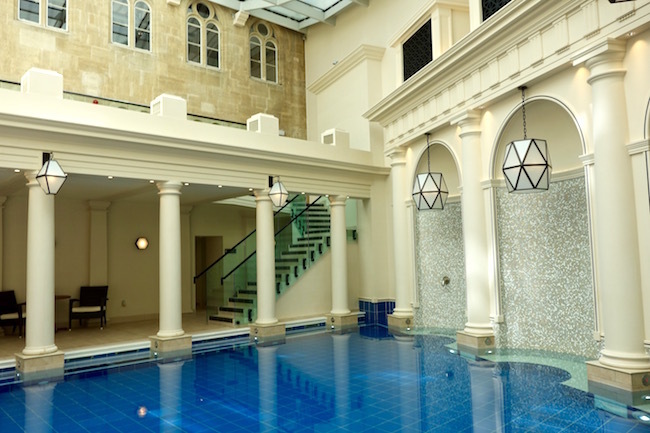 Spa like an aristocrat at Gainsborough Bath Spa: Set in a row of heritage buildings just across from the Thermae Bath Spa, the 5-star Gainsborough Bath Spa is the only hotel in Bath where the thermal water is pumped into the spa. You need to be a hotel guest to use the pools. Read about my stay at Luxury hotels in Bath, the Gainsborough Bath Spa. Hygiene and bathing have come a long way since 1668 when diarist Samuel Pepys wrote “it cannot be clean to go so many bodies together in the same water,” so by all means, enjoy the healing mineral water of Bath for yourself. You can choose from a wide variety of spa packages and treatments. Visit the Thermae website for times and prices. Visits start at £34 for 2 hours. Just a note: There can be lineups so give yourself plenty of time. Go to the source at the Cross Bath across the street from the Thermae. Prices start at £18 for 1.5 hours. This small open-air pool, hidden behind historic stone walls holds a maximum of 12 people. Officially declared a sacred site, it’s the only place bathers can connect with the source of the spring that rises up from a miniature fountain shaped like a crystal ball. Book at the Thermae Bath Spa. For travel ideas read Places to Visit in England. For more information on travel in Britain go to VisitBritain. I’d love to visit Bristol, Julie. You can do a full Jane Austen tour in Bath, Buddy. I think you’d like it. So wonderful to connect it with something so historic. I traveled through Bath but at night so I wasn’t able to really see anything. 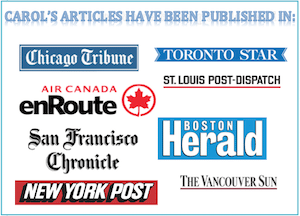 I didn’t realize that there was so much Jane Austen history there! I’d love to go back to see more of the baths, but more so to see where Jane lived and some of the placed she frequented. 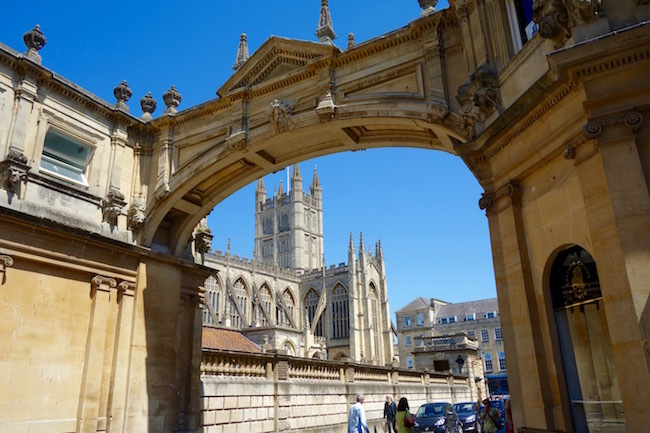 I loved visiting Bath – one of my top weekend trips from London for sure. Of course, while you’re over there, go ahead on to Bristol (another fave) where you can get more gritty city life after relaxing in the spa in Bath! I’m certain it will have something to do with public bathrooms … there’s something wrong there, i just know it. I can only imagine, Sherri! Hey, Jackie – Bath is definitely a good day trip from London. No, the Roman Baths are not operational, Durhams. Not since 1978. Your photos really capture the beauty of the architecture in Bath. I didn’t know there were still any Roman baths still operational? They had an indoor one at the roman bath bar in York, but has since closed off to preserve the history. Oh Carol, Bath is a UK gem that I continue to miss. The architecture is so pretty. I love a good spa and thermal baths are so mind-clearing. I really need to make time for a trip. Thanks for pointing out, too, the practicality of a visit. Only 90 minutes from Paddington Station! Next UK visit for sure! It’s interesting reading what they thought baths could cure and level of sanitation. It always makes me think what people 100 years from now will think of what we do now. What will they be repulsed by that’s so common place today? Budapest has great baths, Karla. And if you liked them, I think you’d like Bath. We tried a bath in Budapest and we had so much fun! :) Thanks for introducing this to me, perhaps I can try this too next time.